This property is more akin to a piece of art than a residence,” says Angie Delattre, of Michaël Zingraf Real Estate – and she really isn’t exaggerating. 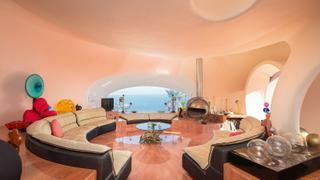 Comprising 26 curved terracotta pods, Palais Bulles (Bubble Palace) was built between 1975 and 1989 by Hungarian architect Antti Lovag. He considered the straight line to be “an aggression against nature” and the residence was designed to reflect humanity’s history of living in caves. 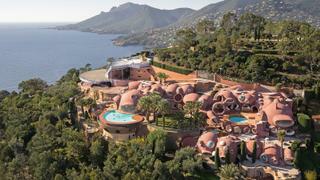 In 1992, Italian-born French fashion designer Pierre Cardin became the second owner of the estate, which is located on a rocky cliff in Théoule-sur-Mer. Since then the eccentric property has been the setting for numerous Cannes Film Festival parties and fashion shoots, and was the location for Dior’s 2016 cruise collection show. 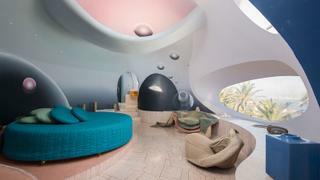 But Palais Bulles has more to offer than just celebrity credentials. 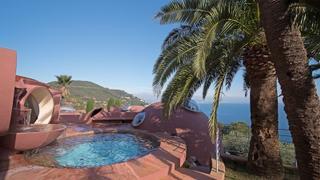 It boasts a panoramic lounge and reception room with porthole windows that present 180 degree views of the Mediterranean. The 10 en-suite bedrooms are free of right angles (they even have circular beds) and have been decorated by contemporary artists. The cascading grounds are equally spectacular. Spanning more than 8,500 square metres, the gardens are scattered with ponds and palm trees and contain an amphitheatre that seats 500. Palais Bulles is less than 5nm from Cannes Old Port, the premium spot for yacht parties during the Cannes Film Festival. In summer, watch competitors attempt to knock each other off colourfully painted boats in the Théoule-sur-Mer jousting competitions. A 10 minute tender blast from Bubble Palace is Île St Honorat, with its working Cistercian monastery. Visit al fresco restaurant La Tonnelle and try the basil and green bean stuffed octopus.